Dr. Ijeoma Igwe received her B.S. degree in Biological Sciences from the University of California, Santa Barbara. She earned her Doctorate of Dental Surgery degree from UCLA School of Dentistry. Upon graduation, Dr. Igwe completed an additional year of intensive training at the Advanced Education in General Dentistry Program- Veterans Affairs Medical Center, Long Beach. 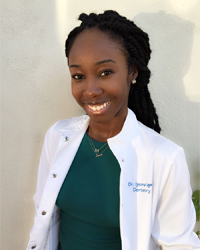 A Los Angeles native, Dr. Igwe takes great pride in improving the oral health and increasing the confidence of the patients in her community as part of The Smile Studio team. Dr. Igwe is a part-time faculty member at the UCLA School of Dentistry. Working with students allows her to appreciate that dental technology is ever-improving. She is committed to continuing education, regularly attending lectures and seminars to remain updated on the newest advances in Dentistry. Dr. Igwe is currently a member of the American Dental Association, California Dental Association, Los Angeles Dental Society, and the Academy of General Dentistry.